An evening of new music, dance, and improvisational lighting design. 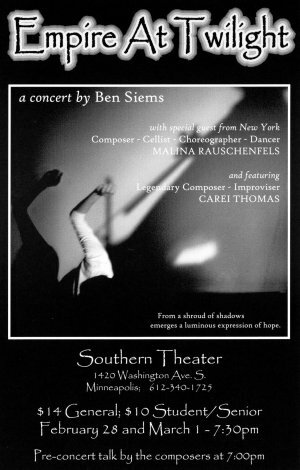 Featured performers will include: Ben Siems on guitar and cello; The Willie August Project's Jeremy Hauer; legendary composer-improviser Carei Thomas; from New York, cellist-composer-choreographer Malina Rauschenfels; dancer-choreographer Jennifer Mack; and award-winning lighting designer Jeff Bartlett. Feb. 28 and Mar. 1, 7:30 p.m.
For reservations, call the Southern Theater at 612-340-1725, or visit www.southerntheater.org. For more information visit the NEWS section of this web site.